In 1983, Norma came to America from Jamaica because she wanted a better life. She raised eight children and had many diverse jobs. She has been a seamstress, a security guard, and a certified nurse assistant, to name a few. Then one day, Norma and her daughter, Verna, were in the car together. Verna remembers her mother saying, “Where are we? Nothing looks the same to me.” Verna reflects, “It was a shocking moment. We were in our own neighborhood.” Verna had worked at a nursing home with a locked dementia unit so she recognized the signs and had that sinking feeling. Her mom was soon diagnosed with dementia and over the course of the next 10 years became increasingly forgetful. Then, last September, Norma suffered a mild stroke. After her stroke, she went from the hospital to various rehabilitation centers and encountered negative experiences, including neglect. While in the rehabilitation centers, Norma was taken back to the hospital on two different occasions and had two lengthy stays in the intensive care unit. Then, Verna learned about the Connecticut Home Care Program (CHCP) and realized it may be possible for her mother to receive care at home. Even better, Verna discovered that she could provide the care through the Adult Family Living service under CHCP and could receive a daily stipend. 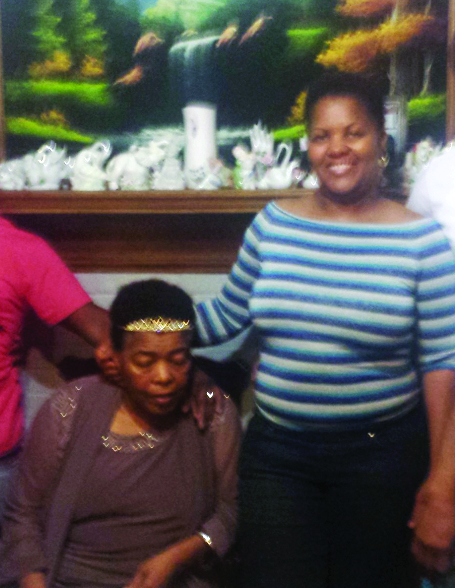 Norma was finally able to go back home with Verna as her primary caregiver. Once a week, a nurse will come to the house to check in and perform a standard health check. Norma’s care needs are great, as she is on a feeding tube, has a Hoyer lift, she uses a customized wheelchair and is what her daughter refers to as “total care.” At press time, Norma’s CCC Care Manager Dan Woike was in the process of getting a ramp constructed to help make access in and out of her home easier. “Verna, in my mind, is a hero,” says Dan. If you are inspired by Norma's story, donate to our organization here.